MAXL Digital Aluminium Composite Panel especially for Digital UV flat printing,which has the outstanding features of smooth glossy surface, high definition printing. Good printing ink absorption, etc. 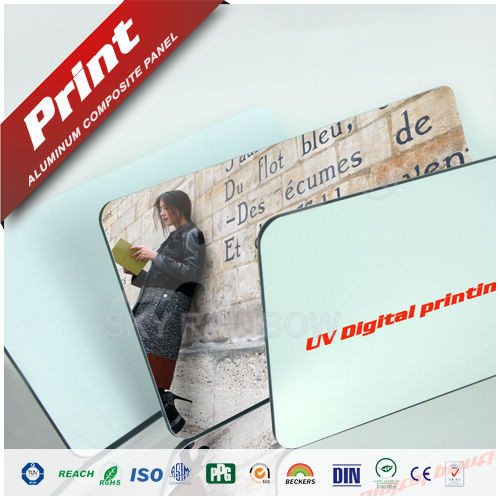 It is an aluminum composite panel especially for high-end digital printing, and a brand new advertising material. 4)Other sizes, colors as per customer's options can be accepted. 2)Easy to further process such as cut, bent or punched to make display platform or shop fronts. 3)Light weight but surprising rigidity, it is the best choice for outdoor advertise. 4)MAXL panel can be bent or curved by normal roller or bending machine, also could be customized as your ideas. The feature of low weight makes ACP easy to transport and handle in factory or on site. even when exposed to extreme temperature changes.